The fort was built on a hill east of Diocletian's Palace, the historic core of Split. In the event of war, the limited distance of that position enabled enemy cannon attacks on the town. Therefore, construction works started in 1647, soon after the outbreak of the War of Candia. 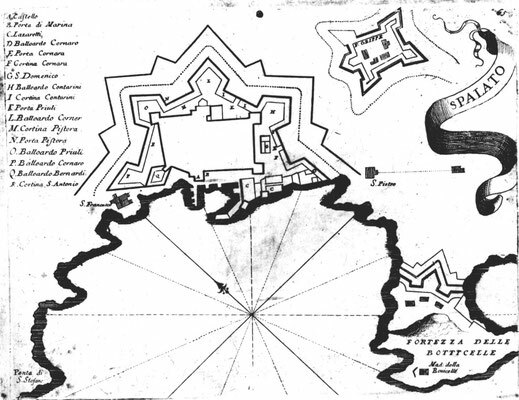 First the eastern part of the fort was built, located on the highest point of the elevation. The fort was supposed to have an unconventional form, somewhat different from the one finally realised. After a break of approximately ten years, the construction was continued by different architects. It can be said that its final appearance is a result of the efforts of three engineers. In the end, the fort had five bastions, but the northwestern one was soon demolished, giving the structure its today’s appearance. Split was fiercely attacked by the Turks in 1657, in a battle fought for the (then still unfinished) Gripe fort. This showed how justified and important its construction was for the defence of Split. During the same war a vast bastion belt was erected, surrounding the town in a polygonal setup. It consisted of three bastions and two demi-bastions; some of them still bear popular names derived from technical terms – Bašćun (from bastione) for the northwest bastion, and Šperun (from sperone) for the street at the site of the demolished western demi-bastion. 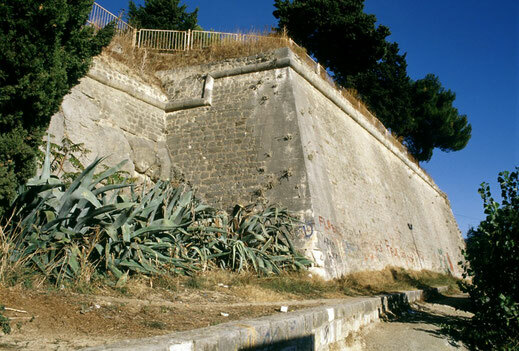 The layout of the former bastion ramparts localises the area of the town as registered on the UNESCO World Heritage List.